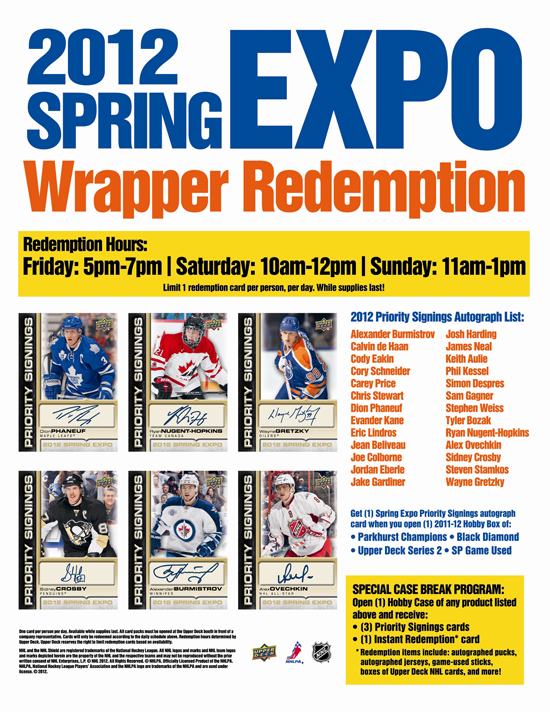 Don’t Miss the 2012 Spring Sports Cards & Collectibles Expo in Toronto this May! 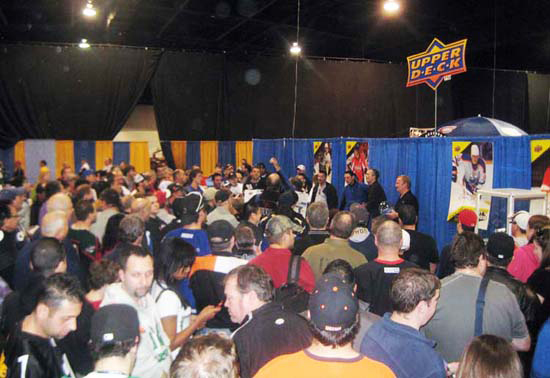 We are just one week away from the 2012 Spring Sports Cards & Collectibles Expo in Toronto, Canada and Upper Deck is prepared to make it a weekend to remember for collectors. As usual, the Upper Deck booth is sure to be a hotbed of activity all weekend long and the place to score the most valuable autograph cards through UD’s Priority Signings Wrapper Redemption program. 2:00 p.m. – 5:00 p.m. – Collectors who asked to have their redemptions replaced can pick up their cards. Also, case breakers can bust their case of 2011 NHL Parkhurst Champions, 2011-12 NHL Black Diamond, 2011-12 NHL Upper Deck Series Two or 2011-12 NHL SP Game-Used to get three (3) Priority Signings cards and a special instant redemption. 5:00 p.m. – 7:00 p.m. (or until supplies are depleted) – The Priority Signings Wrapper Redemption Program begins. Collectors can bring one box per person, per day to receive a random Priority Signings Autograph card. 7:00 p.m. – 9:00 p.m. – Collectors who asked to have their redemptions replaced can pick up their cards. Also, case breakers can bust their case of 2011 NHL Parkhurst Champions, 2011-12 NHL Black Diamond, 2011-12 NHL Upper Deck Series Two or 2011-12 NHL SP Game-Used to get three (3) Priority Signings cards and a special instant redemption. 9:00 p.m. – The Great Decoy Toss Challenge. Test your skill at tossing decoys with Upper Deck’s staff for your chance to win a FREE pack of cards! Saturday, May 5 – Cinco De Mayo Saturday! 10:00 a.m. – 12:00 p.m. (or until supplies are depleted) – The Priority Signings Wrapper Redemption Program begins. Collectors can bring one box per person, per day to receive a random Priority Signings Autograph card. ***NOTICE*** – In an effort to reduce wait times and the line, the program will begin right at the beginning of the show, don’t miss it! 12:30 p.m. – 5:30 p.m. – Collectors who asked to have their redemptions replaced can pick up their cards. Also, case breakers can bust their case of 2011 NHL Parkhurst Champions, 2011-12 NHL Black Diamond, 2011-12 NHL Upper Deck Series Two or 2011-12 NHL SP Game-Used to get three (3) Priority Signings cards and a special instant redemption. 5:00 p.m. – Upper Deck Cinco De Mayo Raffle! Earn some great giveaway items just for being at the Upper Deck Booth at 5:00. Make sure to get there a little early so you can pick up a FREE raffle ticket! Collectors know Upper Deck gives away the best items as a thank you to our loyal fans. Don't miss a second of it! 5:30 p.m. – The Great Decoy Toss Challenge. Test your skill at tossing decoys with Upper Deck’s staff for your chance to win a FREE pack of cards! Sunday, May 6 – Everything Must Go Sunday! 11:00 a.m. – 1:00 p.m. (or until supplies are depleted) – The Priority Signings Wrapper Redemption Program begins. Collectors can bring one box per person, per day to receive a random Priority Signings Autograph card. 3:00 p.m. – The Great Decoy Toss Challenge. Test your skill at tossing decoys with Upper Deck’s staff for your chance to win a FREE pack of cards! There’s always amazing things to be seen at the Upper Deck booth so don’t miss out! If you are tweeting from the show, make sure to use the hashtag #SCCE and #Collect so collectors can follow everything going on at the show! Those rookie Letterman autos look great! I’ll take some please! When does this product release? Thanks for the great previews. Didn’t get enough at sports card expo? check out the WestTO Sports Memorabilia and Card Show on Sunday December 9th, 2012.